I've decided to do something about my weight. 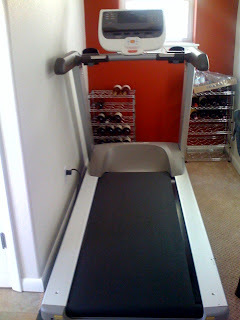 The only time during the past 20 years that I have lost a significant amount of weight and kept it off was back in 2000, when I bought and used a treadmill. I ran on it regularly, and it was easy to do. The treadmill was placed in front of a huge in home theater screen, and I could watch news, movies, etc. as I shed the pounds. Fast forward to 2008. I'm now 53 and carrying a chunk around my middle that I had managed to whittle away when I was in my mid-forties. This time the space is considerably less lavish. We're leasing a home in Boulder while our home on Mapleton Hill is renovated. Construction on that space won't begin for another few months, and I expect it will take at least a year. So the move in date is projected for some time in 2009. Ouch. By that time, without some regular exercise, I'd be pushing the obesity envelope. So I decided to do something about it. Some of you are yawning. 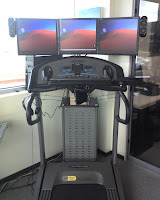 You've seen my friend Brad Feld's "treadputer," and mine looks lame by comparison. But, then, I don't have a bathroom named after me either.